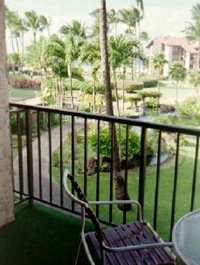 One bedroom, beautifully appointed, oceanview corner unit in Papakea,Kaanapali, Maui.Five minutes from Lahaina Town. A 13 acre tropical paradise on the water, with swimming pools, koi ponds, jogging paths, sauna, tennis, jacuzzis. The unit sleeps 4, one bath,air conditioned, fully appointed kitchen, washer/dryer, dishwasher, TV/VCR with Cable, CD player. View from balcony is sunset over Molokai. It is our Maui home! Excursions to Hana, Haleakala, Iao Valley rain forest, quaint Lahaina Town, activities desk in lobby can do custom activities, golf starting times. Near both Kaanapali and Kapalua courses. Did not stay in this unit but stayed on the property 1 year ago. Grounds are very nice but bldgs are dated so be sure that the unit has been renovated. Otherwise interiors could be 60's style. We were there for a wedding so all guests stayed there in different units so saw most of them, renovated and not. Frequent renters program. Discounts for extended stays - one month or more. Deposit: 50% at time of booking, remainder paid 30 days before scheduled arrival. Cancellations and Refunds: $100 cancellation fee if cancelled within 30 days of scheduled arrival.